Back in January I posted about making furniture made from scrap tires that serves not only to “upcycle” (as my friend Leila insists I call it!) waste but also to help unemployed or low-income Brazilians earn income. 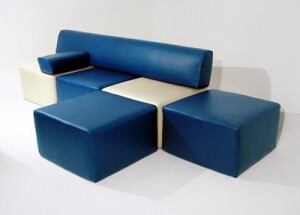 At the time I intended to post a week or two later about similar projects involving furniture made utilizing used PET bottles. The Reciclagem e Cultura (“Recycling and Culture” – Recult) project was started years ago in the Vigário Geral favela in the northen zone of Rio de Janeiro, with the help of a nongovernmental organization Fundação Onda Azul (“Blue Wave Foundation”). The idea for the project is credited to Alfredo Sirkis, co-founder of Brazil’s Green Party (PV). He proposed a project that would encourage recycling, give favela residents honest work and products to sell to earn income, and teach skills to the favela’s unemployed. In part to get the waste collection going and get the raw materials they need, and in part to gain community acceptance for their Cooperativa Usina de Reciclagem, Onda Azul offered favela residents an exchange: bring in 75 to 250 empty two-liter PET bottles, and get a chair or pouffe (what some may call a tuffet, hassock or ottoman) made using PET bottles. 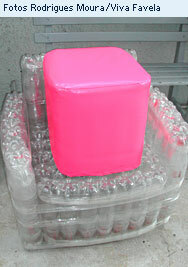 Initially the chairs or pouffes were a bit crude: columns of interlocked PET bottles boud together by clear adhesive tape, covered in clear plastic, sometimes with a thin vinyl-bound foam cushion thrown on the sitting surface. Then they decided to wrap the bottles in a thin layer of foam and put a more attractive cover that obscures the bottles. At first fabric covers were used, until it became clear that these show wear quickly. They switched to more durable vinyl. They also discovered that putting a layer of cardboard between the foam and the vinyl cover made the final product more comfortable. 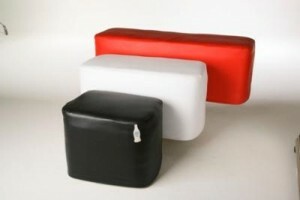 The program proved so popular that they had to restrict the exchange to one pouffe per household. Even so, nearly every house in that favela now has one of the so-called pufes ecológicos (“ecological pouffes”). The project went beyond just recycling — er, (sorry Leila!) 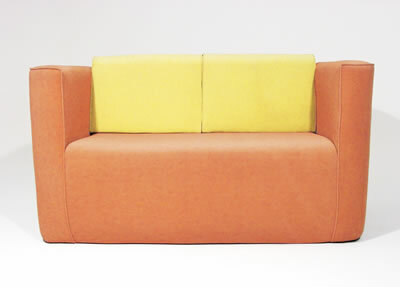 upcycling — to become a small business. 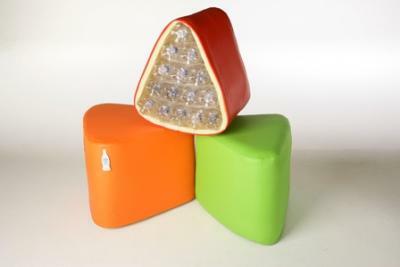 Locals were trained in making chairs, pouffes and later sofas with collected used PET bottles as their primary material, and the resulting furniture was sold to the public. As the quality of their final product has improved (particularly with better coverings), some of the pouffes were even sold in store chains. The project also gained a corporate sponsor: Petrobras. In 2008 Onda Azul brought a similar project to a favela in the capital of the northeastern state of Bahia, Salvador. The project in Bairro da Paz is appropriately known as Tudo se Transformando (“Everything is Transforming”), and it is primarily aimed at training youth. Meanwhile around 2005-06 the São Paulo-based Institute for Technological Research (Instituto de Pesquisas Tecnológicas – IPT) got into the act, analyzing and developing ways to (inexpensively) make beetter-quality furniture using the PET bottles, and then training wastepicker (catador) co-ops in several Brazilian cities to produce the furniture using the methods. 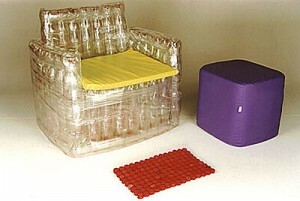 There is also a page at Brazil’s Ecoteca instructing you, step by step with illustrations, on how to make your own basic chair with 200-250 two-liter PET bottles, a pair of scissors and a large roll of tape.